A few of you in the Way Upstream community asked for .pdfs so here are two digital versions of the 2009 Patagonia Fly Fishing Catalog. Each one has some unique features so play around, explore and let me know what you think. The Issuu and Yudu tool bars are very straightforward. Huge thanks goes out to the Marketing and Creative groups for their efforts in making this happen. A special high five goes to Brian Bennett for undertaking the digital experimentation. 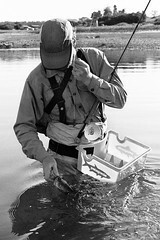 Note that this catalog does not highlight every available fishing product so visit http://www.patagonia.com/flyfishing to see it all. Slick. Nice looking magazine, glad no trees were harmed in the process. Thanks for the positive feedback guys. The number of views received already suggests that the content is of interest and that the format is viable. Keep experimenting Taku. The zoom functions of both programs should more than fill the screen....but keep me in the loop. I'm happy to try to help with whatever tech support I can provide. Question though, I'd love to link this through my blog but none of the options seem to work on Wordpress, anyone have any suggestions? tab open. It won't work if it's pasted in while you are in VISUAL. Let me know if that works Rikshaw (or if that's even the issue). Thanks for considering to post the catalog. Way to go! Looks great. Soon we'll be printing our gear from the catalogue which will cut on the Carbon generated to transport to Africa!